I finally attended the much awaited Vogue Wedding Show 2018. I have been in Delhi NCR for three years now. Yet, two straight years I’ve missed the show for some reason or the other. This time though, I kept my calendar free to attend the biggest luxury wedding show of the year. So what did I think about the Vogue Wedding Show 2018? In one word. Extravagant. Think the who is who of the wedding industry were there showcasing their work. Be it fashion designers, makeup artists, wedding planners. They had it all under one roof. I did, however, assume that the stalls would be much more spread out with a lot more on display. But, the place was so cramped up. Literally, every image in this post will have someone’s hands or legs or full human standing around the display mannequins. It was bonkers crowded. The three-day event started on Friday 3rd August all the way to Sunday 5th August. I went on the first day itself. I have had prior experience with how crazy wedding exhibitions get. But this was a different kind of crazy. Which Brides Will Find Vogue Wedding Show 2018 Relevant? Brides who have a budget of upwards of 2 Lakhs for their main wedding lehenga. Plus those looking for Pre-Wedding Lehengas in the 1 to 2 lakh range. If you are looking for high-end designer wear. Think Manish Malhotra, Sabyasachi, Tarun Tahiliani, Anita Dongre, Shane & Falguni Peacock, Gaurav Gupta, Rahul Mishra, Shantanu & Nikhil and so on. If you want to wear gorgeous over the top bridal jewellery from top jewellery houses. They had some stunning pieces on display. If you are confused about which designer to go for. This was the place to do all your pre-wedding browsing. I even heard some brides flew down from Mumbai and other cities just to attend the show. That was the level of dedication for Vogue Wedding Show 2018. There is limited to no trials available during the wedding show. You only get to browse through the outfits and later have to visit the individual designer’s store for the key fittings and final purchase. Vogue Wedding Show 2018 seemed like what a fish market with south Delhi aunties and brides would look like. A. It was crazy crowded. B. Everyone was waiting for a one on one with the designers. C. It was plain chaos. A good kind though. There were loads of new (new for me) labels on sarees. Very elegant ones. Some of the saree brands were Latha Puttanna, Naina Jain, Palam Silks, Ratanshi Kheraj Sarees, and Vani Anand. So, in case you’re inclined towards the nine yards, yes there were quite a few options available. Some designers had doors, closed doors for entry into the stall leading to a long queue of brides and families. So prizes for guessing who that could be. Our very own Sabyasachi. It got so crazy, that even with a media pass, I couldn’t find my way in. Bummer. Shantanu & Nikhil too had a closed-door stall. So these two designers are not covered in this post. One of the prettiest collection I saw at the Vogue Wedding Show 2018. The bridal lehengas were drop dead gorgeous. So heavy in its embroidery, yet lightweight and looked like a million bucks. Jade normally don’t promote their outfits all that much on social media. So it was such a refreshing treat to the eyes to see so many beauties in one place. The best part, I found one amazingly pretty bridal lehenga for just INR 1,10,000. It looked like such a steal deal for the price. I don’t remember which one it was now. But it’s one of the ivory cream lehengas from the pictures below. However, don’t get too excited. 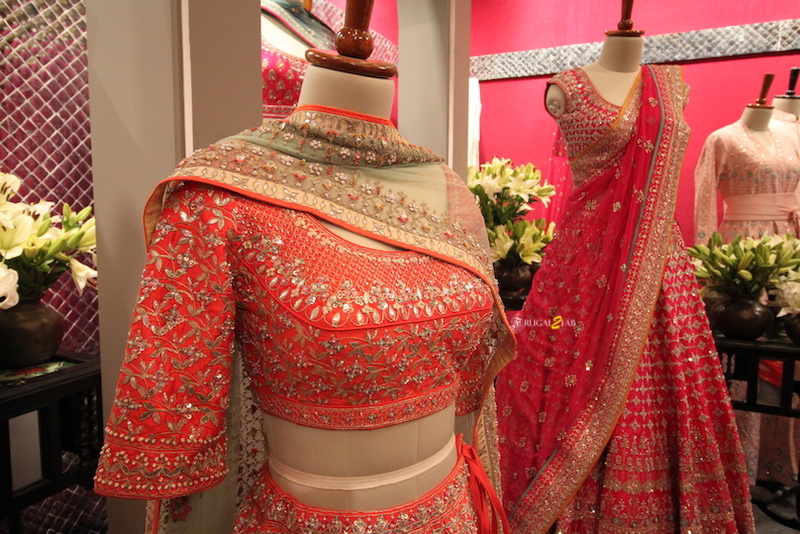 There were bridal lehengas in the +5 Lakh range as well. Also in the pictures below. After going to the Vogue Wedding Show 2018 I’ve realized that seeing bridal lehengas online, in pictures and seeing it, in reality, are two different experiences. Sometimes light doesn’t capture certain lehengas the way it should be. What might look too simple on the picture, maybe stunning in reality. Jade by Monica and Karisma though doesn’t have to worry about a thing. Their bridal collection looked as spectacular in pictures as it did in reality as well. I saw so many brides going ooh and aah looking at their creations. If you are shopping in Mumbai for your bridal wear, and have a budget of upwards 1 Lakh, I highly recommend checking their store out in Peddar Road. I have to confess. I’ve never been a crazy fan of Anita Dongre designs. Up until now. The pictures vs when you see these bridal lehengas up close and personal. I mean woah! They shine from a distance. They are so delicate, pretty and the best part, they don’t take the drama off of the bride. The opulence and the craftsmanship of the bridal lehengas, you only realize when you go up close to the garments. Anita Dongre’s signature style has always been gota patty, and when you do something that good, there is no reason to change anything. Her classic designs in tomato red, coral and hot pinks are my top picks for bridal lehengas from Vogue Wedding Show 2018. The other thing I loved about team Anita Dongre was that they were so open to Media. In a world where everything is copied in no time, I sincerely believe that we as wedding bloggers are here on the right side of the battle. So chucking us out of the system makes absolutely no sense which unfortunately some of the designers still do. Anita Dongre, on the other hand, is so comfortable on the digital platform. It shows within her team members as well as how accepting they are of wedding bloggers and other media formats. In case you are wondering what these Anita Dongre Bridal lehengas cost? They are on the expensive end. Think upwards 3 Lakhs for a full bridal look. But I would again stress on it. You must visit her store once to check these out. They are classics which can be passed down generations as opposed to trendy wedding wear. If you love chikankari, you would love the collection by Rahul Mishra at Vogue Wedding Show 2018. They were sophisticated, elegant in ivory whites, whites and off-whites. The prices were somewhere in the 1 Lakh range. But the variety was amazing. You could pick Anarkali-lehengas, lehengas, and even floor-length anarkalis from this one section alone. Also on the display was Rahul Mishra’s latest 2018 ICW Bridal Collection. The minute one says cocktail night outfits, my head zooms to Gaurav Gupta. Well, if you don’t want to take the Gaurav Gupta route, stop by at Falguni and Shane Peacock’s store. Their lehengas had a mix of fun and traditional elements that would go perfectly in sync with a sangeet night function. The stall was one of the most crowded stalls at Vogue Wedding Show 2018. You know the feeling when everyone wants to be the showstopper performer at IIFA. That’s what I felt looking at this collection. It was my first time seeing a Manish Malhotra collection. So I was naturally high pitched excited. But one look and don’t hate me. But I felt he is better off a Bollywood designer. The only two bridal lehengas that I actually loved from his latest ICW 2018 collection were these brown lehengas. They have eye blinding silver work all over the lehenga. But overall, they look super pretty. As for the feathers, its a trend I’m hoping dies soon. Call me old school, but they look like Ostrich wings on brides. For the most part, Tarun Tahiliani Lehengas were actually super duper pretty. Lovely pastel lehengas with sequins embroidery. Classic reception and cocktail night pieces. But the part I was disappointed with was the ICW 2018 Tarun Tahiliani lehengas. I didn’t like them all that much as I would’ve hoped to. The combination of colours, patterns looked way better in pictures than up close.